Happy Friday! I don't know if it was the grey weather, but this week felt long, not bad long just long. 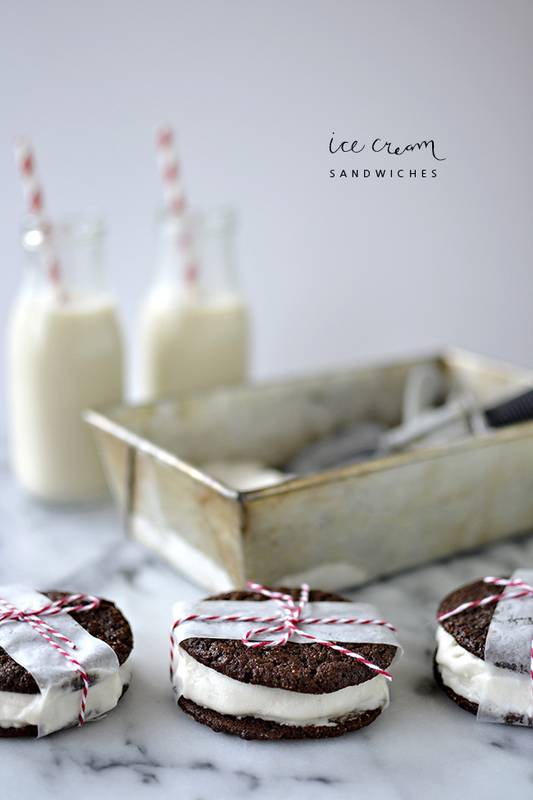 Lucky for me I had these ice cream sandwiches to remind me it was still summer. 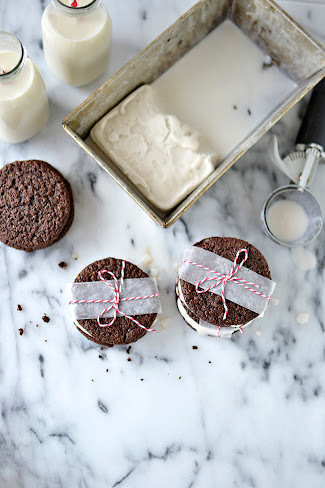 I have been determined for quite some time to make ice cream sandwiches that are gluten-free and dairy-free. Done and done! Though it was a lengthy process to make both the ice cream and the cookies (spanned over 2 days) it was so much fun and totally worth it. 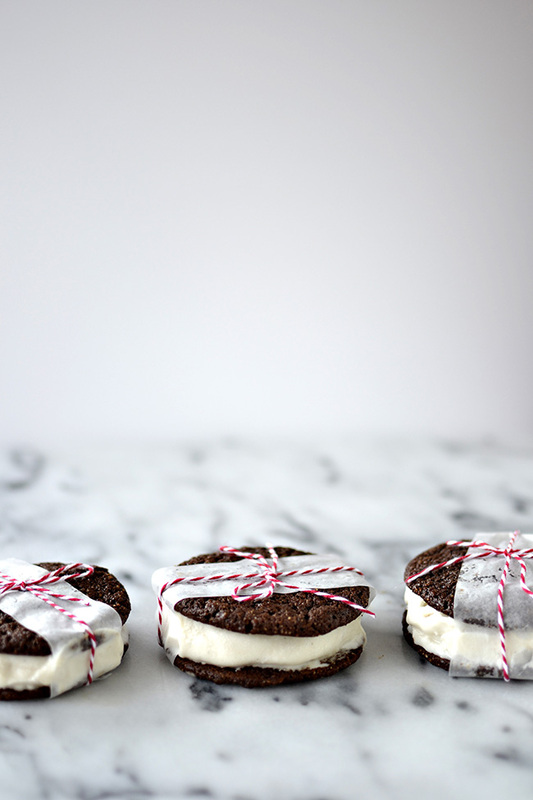 You know those rectangular ice cream sandwiches that come wrapped in paper that you devoured as a kid? These taste exactly like that (and without the stomach ache)! 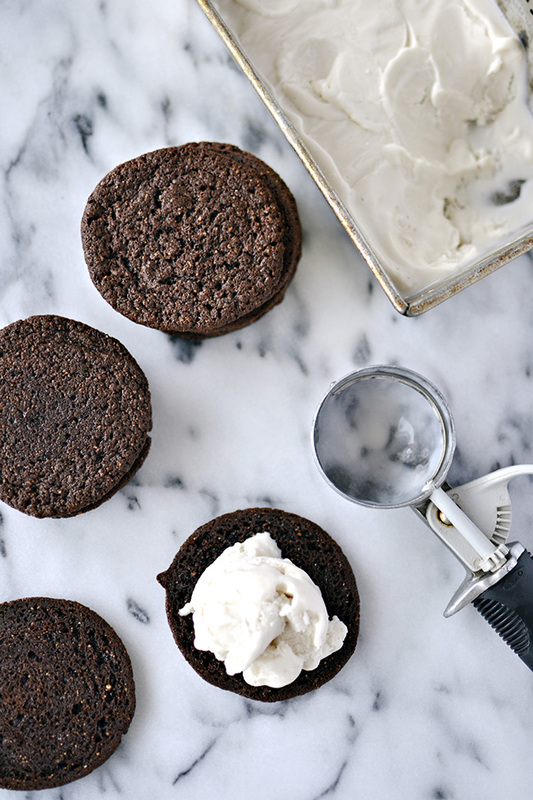 The cookies are so soft that they stick to the ice cream perfectly so and are easy to bite into. I would also like to announce that this was my first time making ice cream and I can't wait to try it again. I'm not gonna lie, while I was churning the mixture I had doubts. That stuff freezes quickly in the ice cream maker!! So turn it fast! 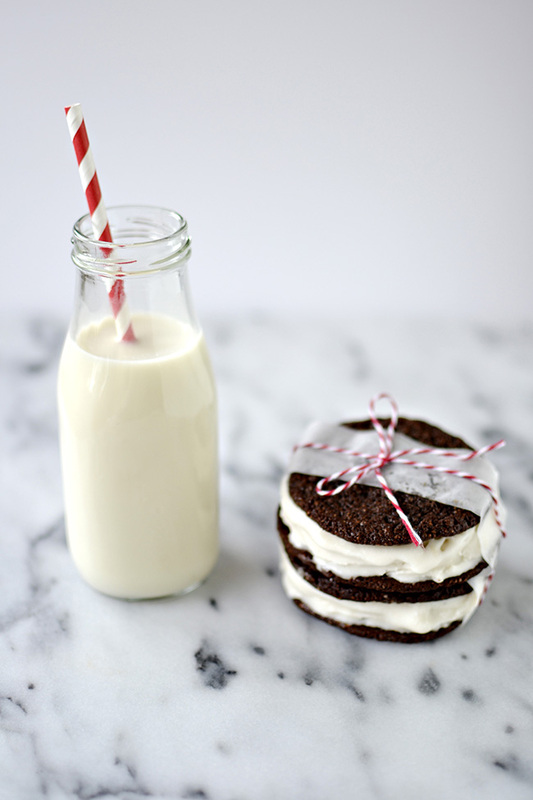 It's made from coconut milk, hence dairy-free, and has vanilla beans in it. It tastes pretty close to good old vanilla ice cream! 1. 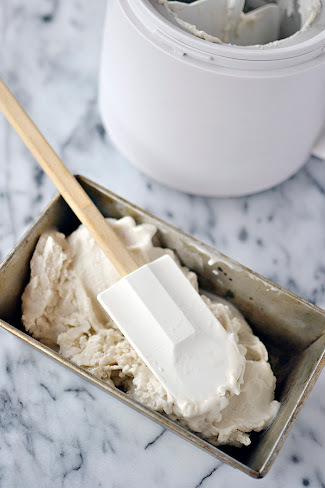 24 hours before you plan to serve the ice cream, freeze the ice cream maker canister. Your ice cream maker instructions may say a shorter time. 2. Slice open the vanilla bean using a sharp knife and scrape out the beans with a dull edge (like a small spoon or butter knife). Try not to get the seeds on your fingers - I did that and wasted some beans :( Measure out 1/4 tsp beans. 3. Pour both cans of coconut milk (all contents) into a medium-sized pot. 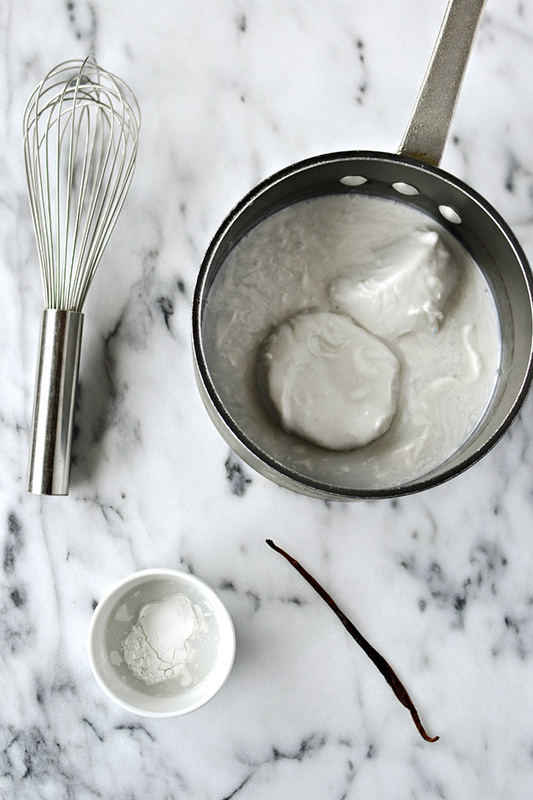 Spoon out 2 tablespoons of the coconut milk liquid and whisk with the arrowroot starch in a separate, small bowl. 4. 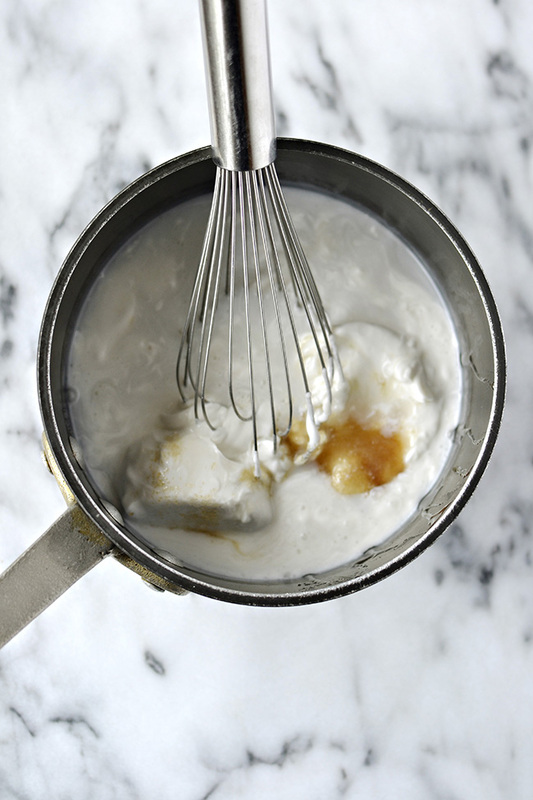 Add the starch mixture back into the pot, along with the honey, cane sugar and vanilla beans. 5. Heat the pot over medium heat and whisk together all ingredients until combined. 6. Add the vanilla bean pod(s) to the pot and bring all to a low boil. 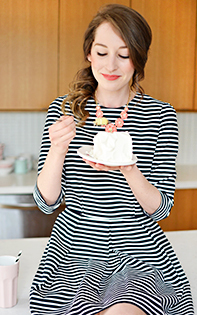 Whisk every minute or two. 7. Pour the mixture into a medium sized bowl and let sit to cool for 3o minutes. Then cover with plastic wrap and place in fridge over night or for 8 hours. 8. 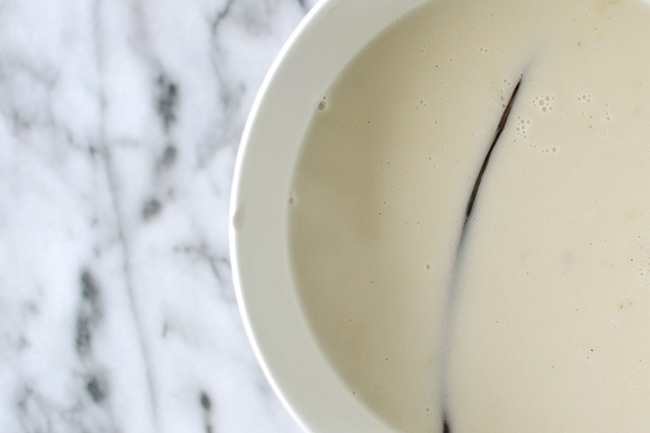 Once well-chilled, remove the vanilla bean pod and give the mixture a good whisk. 9. 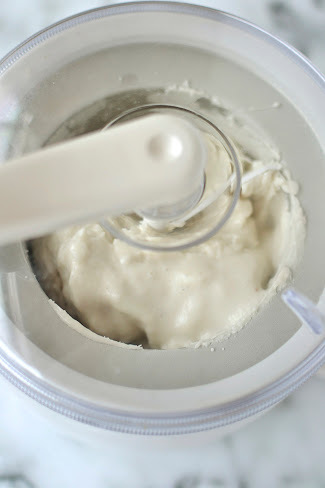 Pour mixture into the ice cream maker and follow the manufacturer's instructions. 10. 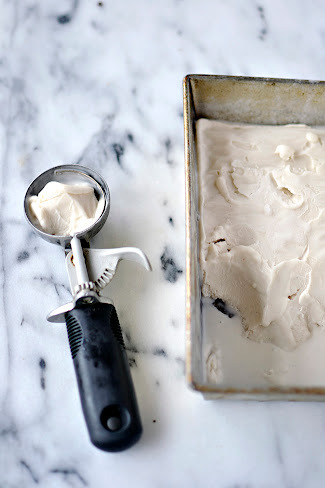 Transfer ice cream to a loaf pan. Pack it down and spread out evenly with a spatula. 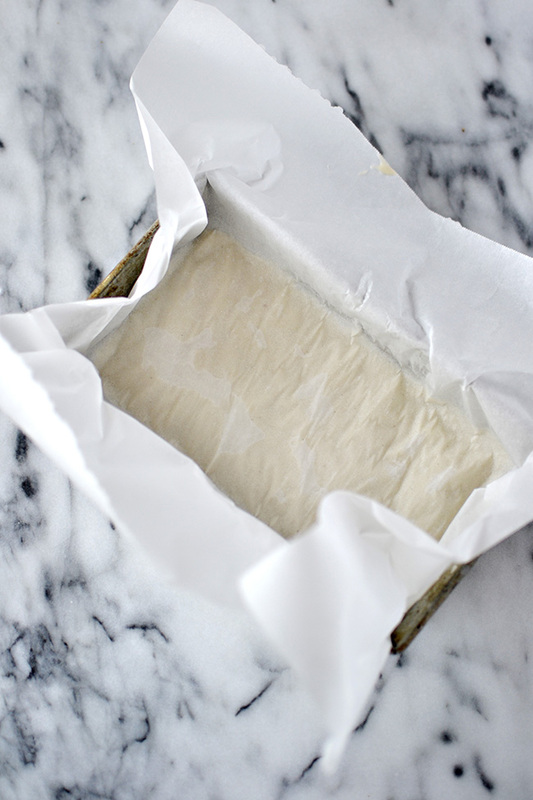 Press a piece of parchment paper overtop and cover with saran wrap. Refrigerate for 1 hour. 2. Melt chocolate in a bowl fitted into a pot with 1/2 inch of water. 3. 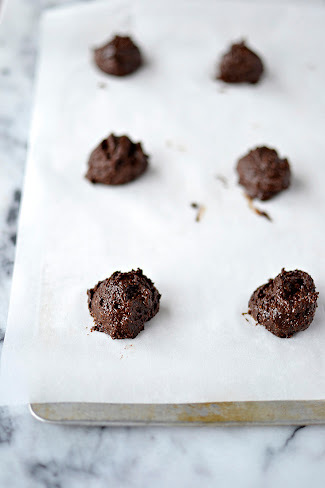 In a food processor, combine the almond flour, cocoa, baking soda, salt and sugar. Pulse until combined. 4. Add the coconut oil and process until the dough resembles coarse cornmeal. Add the eggs, vanilla and melted chocolate and process until the dough is smooth. It will look more like brownie batter than dough. 5. 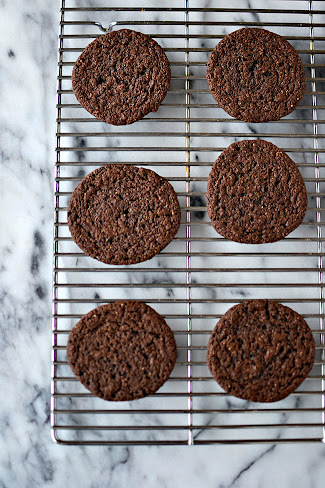 Drop tablespoons of dough onto a parchment-lined baking sheet so that there are 9 cookies evenly spaced out. 6. Bake for 9-10 minutes. You don't want them too soft that they fall apart but not too hard that they crumble. 7. Transfer cookies to a wire rack until completely cooled. Then place into fridge for 1 hour to chill. 1. 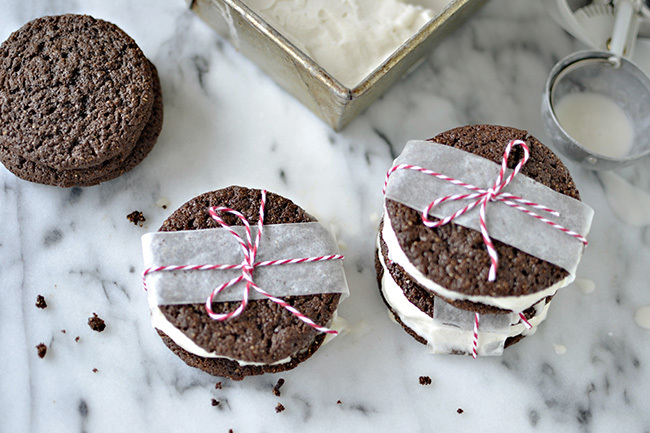 Take out the ice cream and make sure it is soft enough that in can be squished between 2 cookies without breaking the cookies. If it's too hard, let sit out for about 10 minutes. 2. 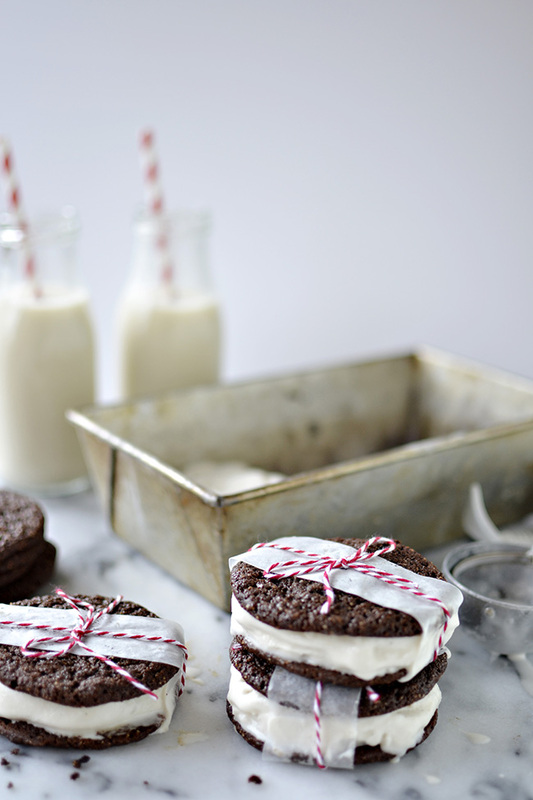 Scoop out ice cream onto one cookie and lightly press down and spread out. Place a second cookie on top. 3. Eat right away or place into a plastic container and store in the freezer. Enjoy!